The Clemson team seeks to accelerate genetic gain in biomass sorghum by adopting a “system of systems” approach (Figure 2), including robotics, sensing, computer vision, machine learning, and genomics to inform breeding decisions. Specifically, the team is developing sorghum varieties adaptable to hot and high-moisture environments, and to sandy or clay soil. These environments are typical of the challenges in the U.S. Southeast, which are different from production conditions for grain sorghum. These varieties will be optimized for energy biomass grown on land in the Southeast not suitable for food production. Figure 2: A ground robot (left) and unmanned aerial vehicle (top right) automatically collect data in the field, which is then processed to extract phenotypic measurements.For example, RGB images can be used to quantify leaf necrosis (bottom right). The team developed three sensor packages on autonomous ground rovers and unmanned aerial vehicles (UAVs). 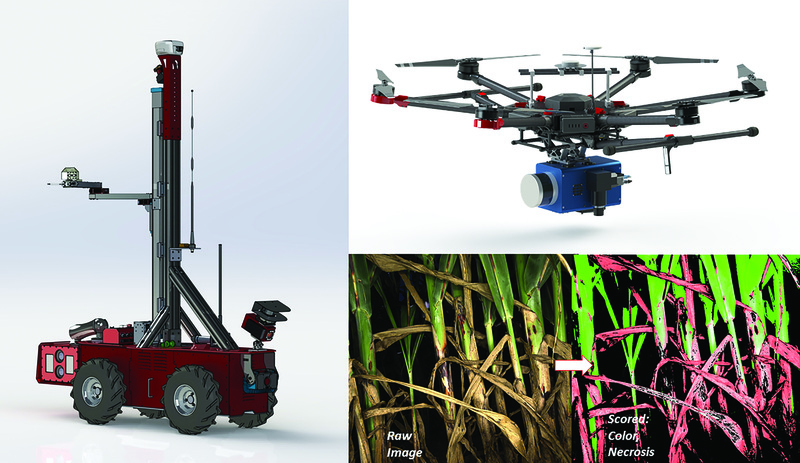 The ground-based and aerial platforms use visual, thermal, and LiDAR sensors to evaluate the structure of sorghum. A third platform uses a robotic arm to grasp plant stems and evaluate physiological or compositional traits, including stalk strength. All three platforms have modular sensor packages and can add upgraded sensors. After collecting data, the team needed to extract phenotypic data to identify optimal trait values. To accomplish this, the team is developing learning algorithms that draw plant boundaries and evaluate traits, and predictive algorithms that estimate end-of-season harvest attributes with early season characteristics. The final step identifies causal genes for optimal trait values and design crossing strategies. If successful, the results will be high-yielding plants (Figure 3) that are well suited to their environment. 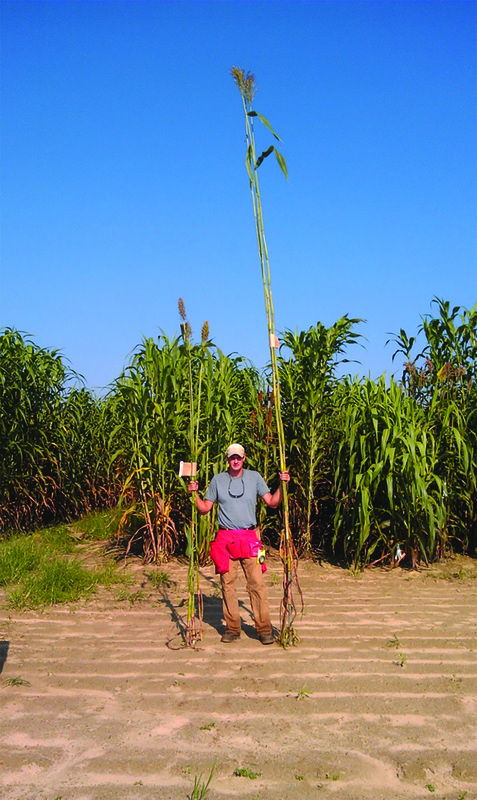 Figure 3: A high-yield biomass sorghum plant (right) compared to a normal sorghum plat (left). The team has formed or partnered with several companies to bring different aspects of the project to market. Carolina Seed Systems, a genetics company, will produce sorghum and other seed, bred for Southeastern conditions; TERRA-SCAN a start-up that provides phenotyping and field scouting services; and Near Earth Autonomy, another start-up, that will market a data collection product derived from the team’s aerial platform. The project expects significant intellectual property in computer vision and machine learning that will be broadly applicable for plant breeding and other agricultural research. The USDA forecasted that over 90% of U.S. cellulosic bioenergy needs will be met through production in the southern United States, with sorghum as a key feedstock. Success in meeting these demands hinges, in part, on the ability to rapidly identify and breed plants with favorable phenotypes for fuel production in the southern United States. If successful, this project’s technologies will produce precise measurements of plant performance. This data, coupled with genomic technologies and new algorithms, could enable the development of bioenergy crops that sustainably lead to a large supply of biomass for biofuel production. As of December 2017, the Clemson University project had generated three invention disclosures to ARPA-E. This project has also published the scientific underpinnings of this technology four times in open literature.